The Weills purchased the Ward estate in 1963, but apparently did not sell this block to their principal client, Benjamin D. Phillips, because it does not appear in his inventory. 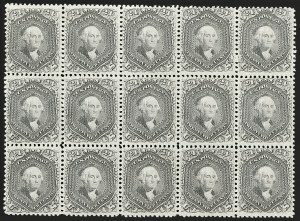 The earliest auction offering of this block was in our 1968 sale of the Lilly collection. It was offered again by our firm in 1974 and in the 1979 Rarities sale, where it was bought by Ryohei Ishikawa for his Grand Prix 1847-69 exhibit. Mr. Gross purchased it after the 1993 Ishikawa auction. 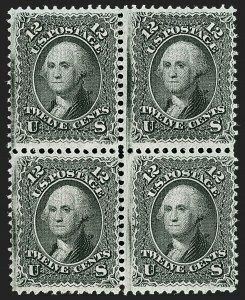 There is only one other imprint block of the 3¢ C Grill, a left margin block of four that was part of the Lozier and Sinkler collections, then reappeared in our 2012 sale of the Frelinghuysen collection (Sale 1021, lot 240). 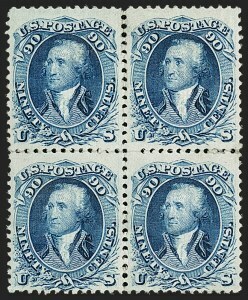 The block offered here is the better centered of the two. Unused or original-gum examples of the 12¢ Z Grill are rare. Only one block survives--the block of four offered here--but prior to 1940 this block was part of a block of nine, which was owned by Joseph T. Lozier and Wharton Sinkler. 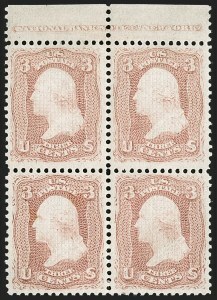 According to Ward, it was broken into a block of four (bought by Ward), strip of three and pair at the time of the 1940 Sinkler sale. 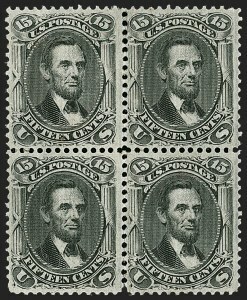 The top strip of three was still intact in 1962 when it was certified by The Philatelic Foundation (PFC 15569). 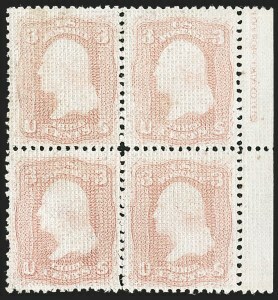 Singles from that strip and the lower left pair have appeared in the market, confirming that they no longer survive as multiples. The Chapin census records more than 30 plate number multiples for Scott 73, 87 and 93. 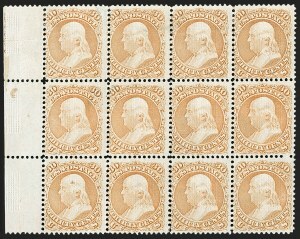 However, only seven come from Plate 29, and of those, only four are plate blocks. More significantly, only three plate number multiples of the E Grill (Scott 87) are recorded, and none are blocks. 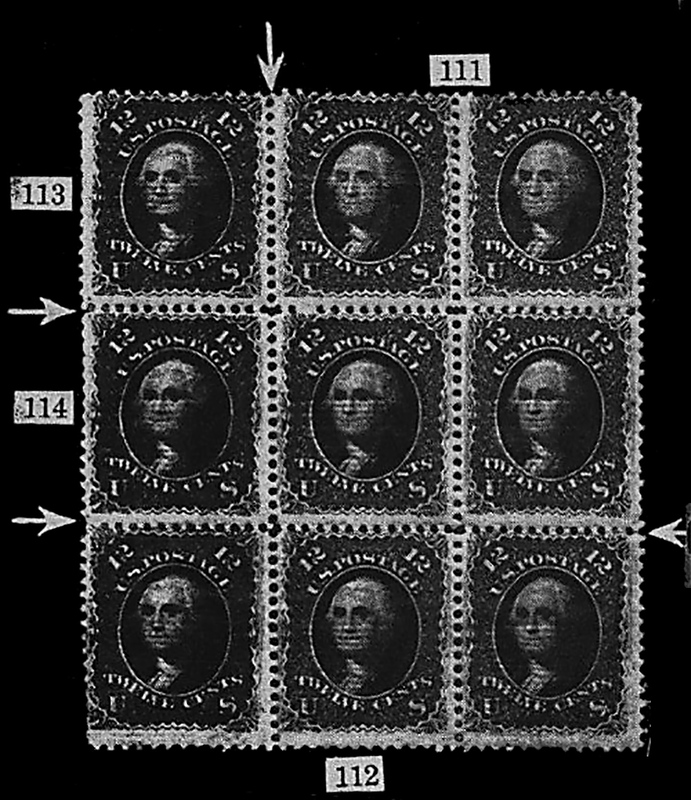 This strip includes the major double transfer position, which is present on the imprint positions of only one side of Plate 29. 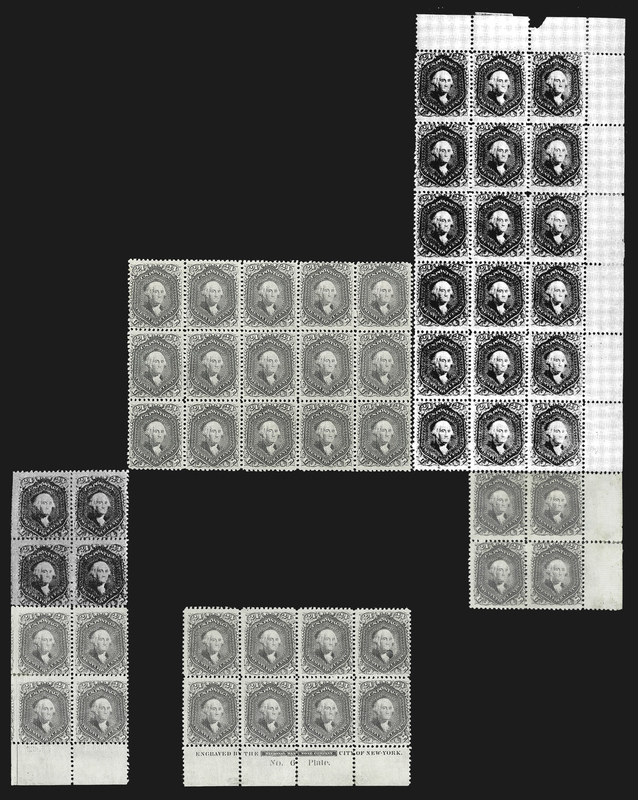 Boiling down the 8 Chapin census listings of Scott 88 to just plate blocks, there are just two (both Plate 36). The pane listed as no. 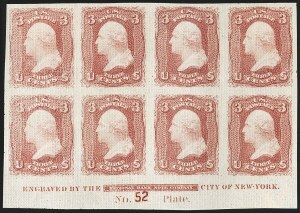 286 was sold in Siegel Sale 818 (lot 604) and then divided into smaller units, including this block. 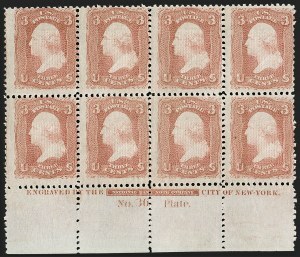 The only other full plate block of eight was part of the pane listed as no. 287, which was in the Col. Green collection (Costales 2/19/1945, lot 15, no photo). 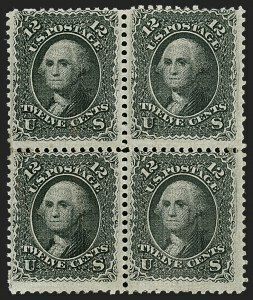 Blocks of the 12¢ E Grill are much rarer than multiples of the 10¢ or 15¢ E Grill, or the F Grills up through the 15¢. 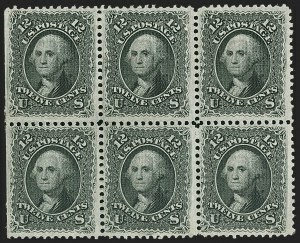 Not one block of the 12¢ E Grill was included in the massive classic collections formed by Caspary, Crocker, Eno, Lilly, Moody, West or Ishikawa. 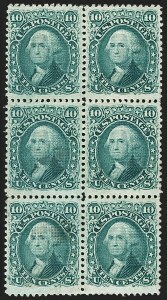 The Green collection had two off-center blocks, and the Klein collection had one off-center block (all with original gum). 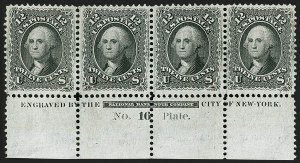 The Chapin census records more than 30 plate number multiples for Scott 73, 87 and 93, but there are only seven strips of the F Grill (Scott 93), and no plate blocks outside of the two recorded panes of 100. One pane is believed to remain intact following its sale in 2002 (Metzger collection, Matthew Bennett Inc.). The other was part of the Maryette B. Lane Black Jack collection that was stolen decades ago, but was not contained in the recovered material. 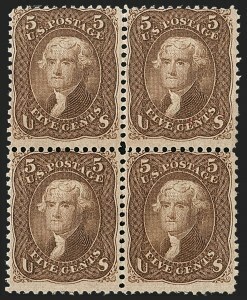 Unused blocks of the 5¢ 1861-68 Jefferson stamps, in any shade, grilled or ungrilled, are rare. 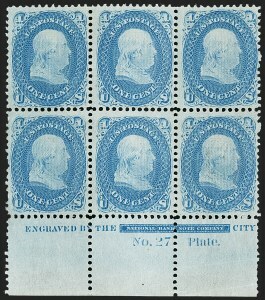 The only ungrilled plate number multiples are a plate block of eight of Scott 76 with "Specimen" overprint, a Scott 76 plate strip of four (Siegel Sale 422, lot 204), and the strip offered in lot 71. 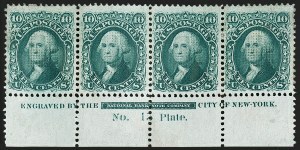 This is the only recorded plate number multiple of the 5¢ F Grill (Scott 95). The earliest report of this strip's existence we can find is an entry in the Benjamin D. Phillips inventory indicating it was purchased from Warren H. Colson in February 1955. After the Weills purchased the entire Phillips collection for $4.07 million in 1968, the strip appeared in auctions before selling to John C. Chapin. In 2002 the entire Chapin collection was acquired by the Shreves in a sealed bidding process and then sold privately to Mr. Gross. 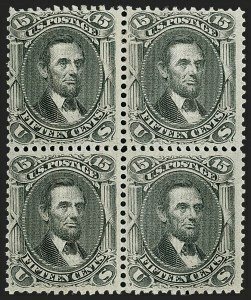 Therefore, based on the above careful analysis, this strip of four is the only known 12¢ 1861-68 stamp multiple with the full imprint and plate number. It was part of the Chapin collection, which Mr. Gross acquired in 2002 in a private transaction. Ward's block passed to the Weills in 1963, when they bought his estate, and one year later to their principal client, Benjamin D. Phillips. After a few appearances in auctions, it was bought in the 1992 Rarities of the World sale by Christopher Rupp, who sold it privately to Mr. Gross. The Weills bought the entire Phillips collection for $4.07 million in 1968, and divided the block of twelve into two blocks of six. 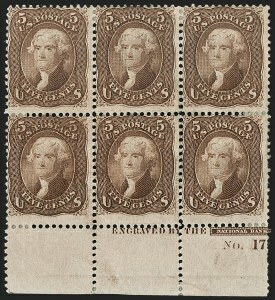 The left sheet-margin block was sold to Stephen D. Bechtel, who had it certified in 1970. 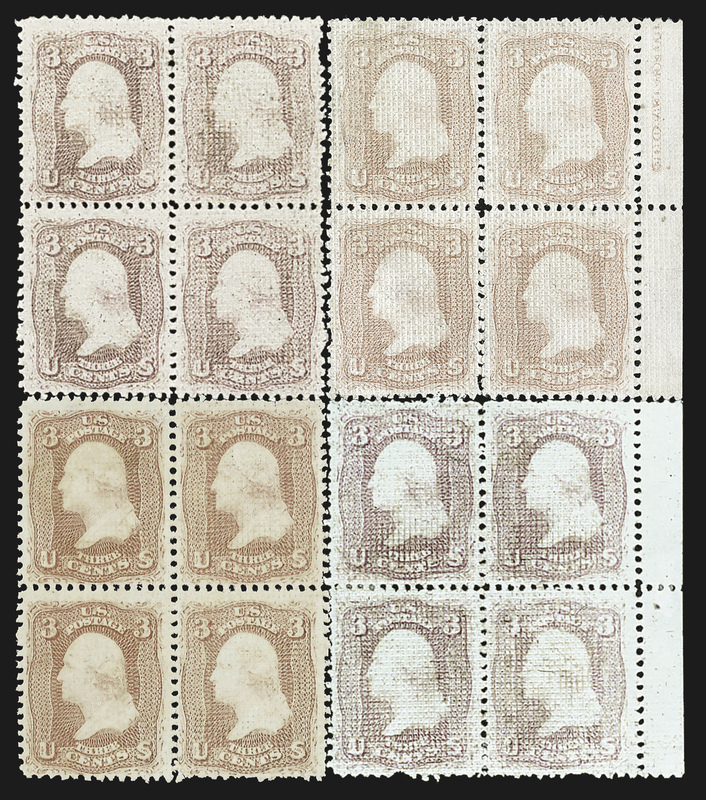 At the 1981 Rarities of the World sale, the right block was purchased by Ryohei Ishikawa for his Grand Prix award-winning 1847-69 exhibit. 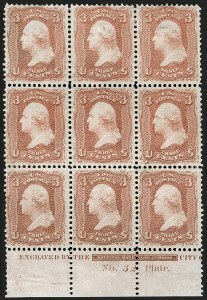 The right block was bought by Robert Zoellner in the 1993 Ishikawa sale--one month before that sale, he had acquired the left sheet-margin block from the Bechtel collection in a private transaction. After 23 years, the two blocks were reunited in his collection and sold as one unit to Mr. Gross in the 1998 Zoellner sale held by our firm. The block offered here passed from Caspary to Lilly and eventually to Ishikawa. In the 1993 Ishikawa sale, Mr. Gross acquired it for his collection.